Home Cloud What is Cloudcraft? Cloudcraft is an online tool that helps you visualize AWS architecture. The tool also allows users connect securely to their AWS cloud environment and use live resources as part of their visualization. Once live resources are imported, Cloudcraft stays connected relaying up to date information including the health and current status of the components. The key benefit in using a tool like Cloudcraft is, the tool allows users visualize their architecture and analyze costs before deployment, and keep a close eye on live resources after deployment. Though Cloudcraft offers support only for AWS, there is a good chance that this will be expanded in the future to include other large scale cloud computing providers as well. 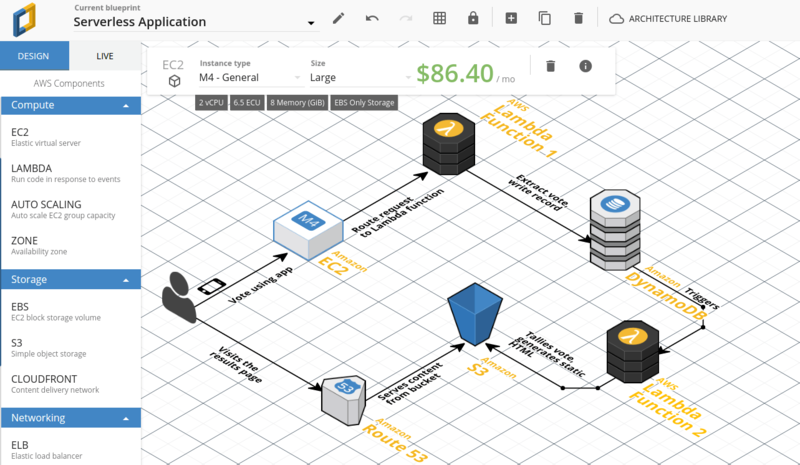 Cloudcraft visual designer can be used to build AWS resource visualizations and diagrams. Cloudcraft offers three pricing tiers; Free, Pro and Enterprise. In the free tier, a single user can have unlimited private diagrams, design advanced AWS architectures, export and share the diagrams, do cost calculations and attach docs to individual components. Pro Tier costs $49 per user/month but comes with unlimited drawing space, ability to connect live resources,unlimited AWS accounts, share and edit docs and diagrams with your team, API access, two-factor authentication and priority email support. Enterprise Tier pricing is available only on request. This tier includes all the features offered in the Pro Tier but it allows your entire company to use Cloudcraft and offers customized support. Cloudcraft currently offers a 14 day free trial and a 30 day money back guarantee as well. According to Cloudcraft, “Staff, teachers and students at educational institutions are eligible for a 50% discount on any Cloudcraft Pro subscription”.